The continuing uncertainty over how Brexit will pan out is continuing to be challenging for Irish companies, though indications are that more are better prepared for whatever scenario results than six months ago. That’s according to Simon McKeever, CEO of the Irish Exporters Association (IEA), who was speaking at a well attended West Regional Council Meeting of the IEA, held on the premises of pharmaceutical company Allergan in Westport, County Mayo on 28 November. Analysis by the IEA indicates that over half – 53.3% – of Irish companies now have Brexit mitigation plans in place. These include preparing to move staff to or from the UK, or shifting production to or from there. There’s a severe shortage of warehousing in both UK and Ireland, with companies unsure with the present uncertainty whether to invest in building additional storage facilities. He outlined that Customs procedures, tariffs, additional costs and border controls topped the concerns Irish exporters have once Brexit happens, with the impact on the UK Landbridge a key concern for the 67% of those surveyed who use it. Speaking on the impact of currency movements, Simon noted that if it hadn’t been for Brexit, then Sterling would be at an historic high now. The currency situation remains very volatile, with profitability for exporters disappearing at an exchange rate of 90-95% for most. He predicted that if the UK Government doesn’t get its deal through Parliament that the exchange rate will go above parity. Howard Knott, Logistics Consultant with the IEA provided an overview of what options are open to exporters to Europe. The UK Landbridge is the fastest option with it being possible to get from Dublin to Calais in 18 hours thanks to four sailings a day from Dublin to Holyhead, and hourly sailings from Dover to Calais. On the other hand there are disadvantages such as high costs, additional wear and tear on trucks (and Drivers), problems around weekend truck bans, motorway taxes and traffic jams, and strict driver’s hours legislation. Additionally the receiver has to discharge the load immediately or any advantage on time is lost. In the event of a hard Brexit, Howard advised that AEO (Authorised Economic Operators) Certification can help in certain situations, though food or agri loads will be examined regardless of AEO status. Medical devices can also be caught this way, while if a product is one consignment in a groupage load, then it is likely it will be pulled in. He also highlighted the possibility of needing a UK driving permit to transit the UK. Howard outlined other potential options for direct sailing to the Continent, including routes to Zeebrugge in Holland. With regards to ports in France, Cherbourg has little rail access and not great road connections, while Le Havre appears to have ongoing issues with strikes, and Calais is a good deal further for Irish operators. Looking at direct Ro-Ro ferry routes, he noted that the Brittany Ferries’ Cork to Santander route has been a slow take-off in terms of volumes. Irish Ferries sails 3 times a week Dublin to Cherbourg with the WB Yeats, while Stena Lines sails three times weekly from Rosslare to Cherbourg taking approximately 14 hours. Neptune Lines also sails once weekly from Rosslare to Santander. A number of ferry services offer Lift-on – Lift-off Container Services including Eucon, Samskip, DFDS, and BG Freight variously from Dublin, Belfast, Waterford and Cork. One of the advantages of direct sailing to places like Rotterdam and Antwerp, noted Howard, is that they are well connected to principal European destinations with direct rail services. For example it is possible to ship from Rotterdam to Milan within 24 hours. Finally Howard pointed out that Brexit has forced Freight Forwarding companies to plan ahead by booking booking space months in advance. 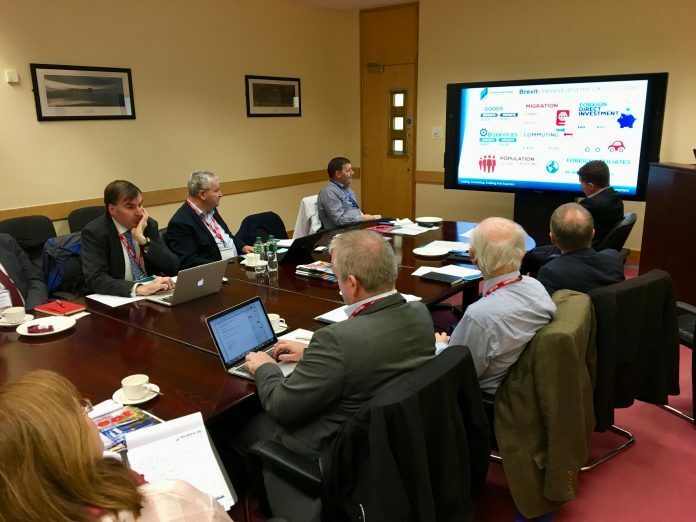 Patrick Edmond, Group Strategy Director, & Managing Director of International Aviation Services Centre at Shannon Group outlined the efforts of the County Clare based airport and development centre to attract additional freight transport. Noting that National Aviation Policy has designated Shanon for freight, the challenge he said, is to identify clear information on how many tonnes of freight are going where, and what the opportunities are to attract them to Shannon. Another challenge is that freight forwarders will often just choose the cheapest way regardless of whether they are bypassing local opportunities like Shannon – for instance they may prefer to transport freight by road to the UK and then fly to the final destination from there without consulting with the exporting company. Currently UPS, FEDEX and DHL fly nightly out of Shannon, while Turkish Airlines operates three flights a week. Patrick outlined some of the benefits of using Shannon as a logistics base, which include having ample development land that can offer uncongested cargo and logistics facilities, and a commercially focussed Authority, with companies praising the co-operative mindset. He highlighted the positive feedback from companies such as Jaguar Land Rover and DB Schenker who have invested in the area recently. Cathal Doyle.